These stories are factual. The pictures have been changed to protect the innocent... me, and those like me, who terrify easily. Dragging his trap behind him. Truth is... there are no clocks in our basement. And for the exact time I can't say for sure. But a mouse trap was set... 4 of them to be precise, each smeared with peanut butter and strategically placed inside our cellar. I know this because my husband told me after seeing small droppings (poop presents) where previously there had been none. But now I'm told there are 3... three traps, three dead mice, and one trap missing, as in gone, vanished, nowhere to be found. I freaked!... soon after hearing the words house and mouse mouthed together. "Eek!" no, 'Double Eek!' for somewhere in this house there's a mouse, big and powerful enough to pick up a wooden trap... and carry it with him! Obviously, I don't like mice, and many other creatures I haven't mentioned; but right now the only thing keeping me from jumping out of my skin is that I haven't actually seen anything. Not a single sharp-clawed, twitchy-nosed, naked-tailed, furried-critter has yet to ascend the basement steps and enter my personal space. And to keep things that way, we drove to Lowes Home Improvement Center where we met an employee offering advice on anti-rodent invasion supplies. "Mice will chew right through that spray foam you're holding," she said. "You're better off using steel wool to fill in large gaps. Mice won't go near the stuff." This woman knew her "stuff" apparently from first-hand experience. 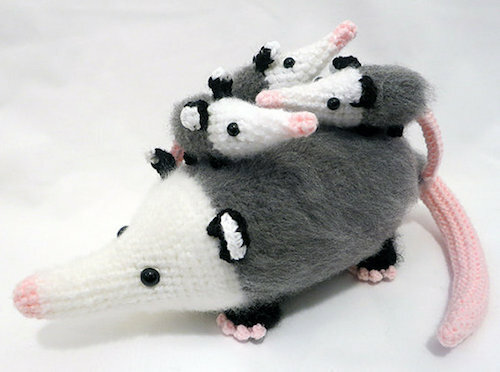 Her son raised mice for a local pet store. And her neighbor raised chickens, which attracted large colonies of mice. So between her son's few escapees and those from next door, soon HUNDREDS of mice were running amuck in her house! After closing my dropped jaw, I asked, "How did you cope?" "I'm not afraid of mice," she said. "I just picked them up by the tail and got rid of them. And I used poison. The poison worked great, but isn't sold anymore because dealers used it to cut their drugs. Which was way more information than I could assimilate; I clearly stopped listening after hearing... 'hundreds of mice running amuck'. And here I thought my 'Triple Eek' moment was scary, when years back, in the middle of the night, while living in Jenkintown in our loft space above a candy store, I heard, then saw, my bedside trash can move! Right there, just inches from my head, was... a GIANT RAT! "Eek! Eek! Eek!" I screamed, though it may have been just one long "EeeeeeeeeeeK!" that woke my husband. "It's just a dream," he groggily muttered. "It's a GIANT RAT" I sputtered. And like lightening we bolted from our comfy king-sized bed, and ran into my studio, where we both laid, squished and immobile on a daybed, perfectly sized for one person. Neither of us slept. Even if we had dozed off it wouldn't have lasted because with daylight came audible cries from the far end of Michael's studio. Bravely, my weary husband, my hero, headed out to investigate. There he found, stuck inside a five-gallon plastic bucket, not an oversized mutant rat, but a baby-sized OPOSSUM! The first of many! Unlike rodents who scurry and jump when threatened, opossums play dead. Over the next few days, six opossums, or a passel (a group of opossum) were captured in habitat traps and set free. As simple as it may sound, capturing these marsupials wasn't easy or convenient. 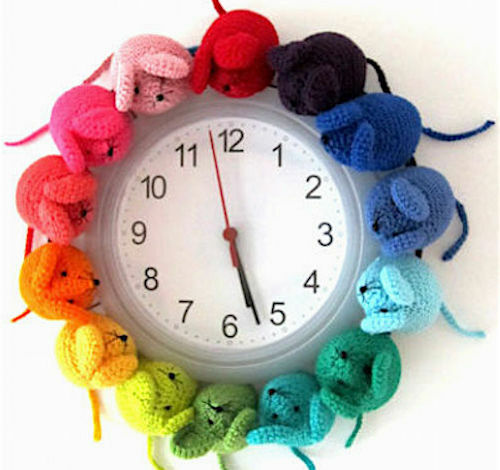 Often it was between 2 and 3 in the morning when their cries, like blaring alarm clocks would alert us to Quickly Get Up!, Quickly Get Dressed!, and Quickly Drive! to the nearest park where they would be released... ever so... s-l-o-w-l-y. Slowly, because the opossums refused to move; they all played dead! Michael handled and transported all the creatures; I was just a passenger along for the nerve-wracking ride. And once her children were gone, Mama Opossum, who had been living beneath the floorboards, chose to exit the building and never return. Which is my exact wish for the field mice now inhabiting our place in Glenside, that they leave of their own volition and never return! Better still... that their love of the outdoors keeps them from ever venturing indoors! And that missing trap? Fortunately for us it was found with its catch intact inside a hollow concrete block. 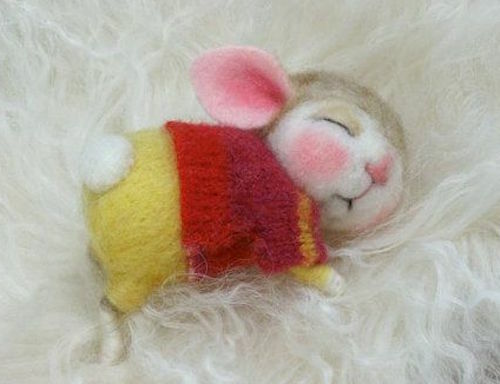 Not so fortunate for the mouse, who was once believed to have super-natural ability. Several more mice have since been caught, but none lately. "Now, Speedy! now, Stuart! now Mighty! and Mickey! On, Templeton! on, Jerry! on, Chuck E! and Minnie! 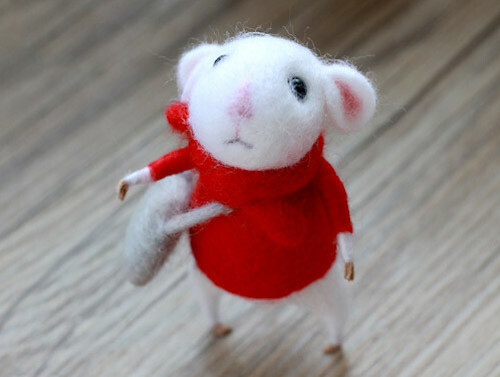 I got quite a kick out of your mouse story! I laughed out loud at the mental image of you and Michael jumping out of bed and running into your studio to cram together on a small daybed. I must say that seeing a giant rat near my head would have me running off screaming too. Fortunately it was only a baby possum but they do look like giant rats. I'm glad they were all taken to a park and released. Next time we talk I'll have to tell you about our possum story. It's too long for this space. 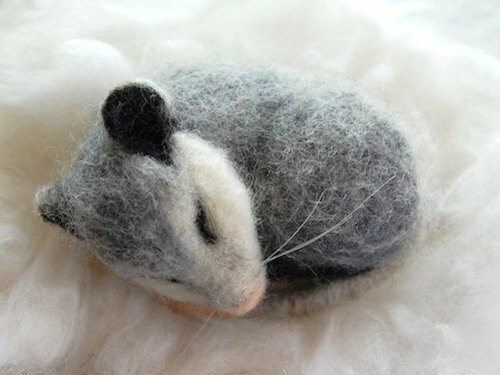 I love the adorable little felted and knitted mice and possums. Too bad they aren't that cute in real life. 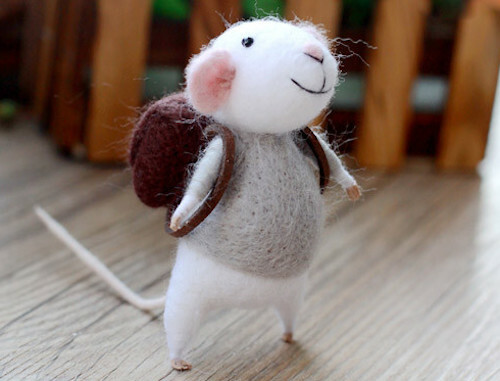 I also have a mice story to share with you. Again, it would take up too much space here.